I was hoping not to have to do another of these Untappd Catchups for a while; but once again life, and far too many (can there ever be TOO many beers?) got in the way. Here's a wrap up of 9 beers that earned badges in less than a week! If I'm being totally honest this wasn't all completed within a week, more accurately remembered within a week! I drank a Fosters, which they're really pushing here for the first time I can remember in my life, on my boys weekend last week. It was ice cold and drinkable. The badge; Lager Jack (Level 37). Recently Untappd decided to make Sky's the Limit into a leveling badge. This badge is earned by drinking 5 or more beers over 10% ABV. The beer that tipped me over into Level 7 was Blaecorn Unidragon from Clown Shoes. This is, quite possibly, my favourite Russian Imperial Stout! It's huge (12.5%), as roasty as they come, has great hop presence and no sweetness whatsoever! Seriously it's perfect! The firs of two badges earned at Ballarat Beer Festival was Brewnette's Have More Fun (Level 2). It's a badge for drinking Brown Ale's, like most Untappd badges leveling in 5 unique check-in increments. Savarain was the brewery, the beer their S'In Brown Ale. I was the first to admit to the guy there that I'd never heard of them before - apparently they're a tiny operation down near Sale that sell kegs to 2 or 3 venues only, which made me feel a bit better. That being said - this was quite a fine Brown Ale and one that I would definitely have again if I saw it. Pale as the Moon (Level 33) went to Wayward Brewing's FUSAMI Victory IPL. Yes that's right - the badge for drinking Pale Ale's went to an India Pale Lager. This was towards the end of the day at BBF and all I can think of as an explanation is that Untappd was as drunk as I was! That being said; I loved it! IPL's are pretty much my favourite style to drink at the moment! I hope this one becomes more readily available as I'd love to try it in a less inebriated state. Minimatta from Yeastie Boys was the beer I used to recover from Ballarat Beer Festival and in doing so picked up Drink Like a Kiwi (Level 13). It's a 4% tea infused Pale Ale and I have to say it combined the "hair of the dog" cure with the cup of tea cure perfectly. This one came from the Tru Bru Bear Club and you can read a little more about it the November/December pack review. Lizzie and I headed up to Sydney a few days before the Asian Cup Final for a little bit of a break and surprise surprise we found ourselves in a number of fine drinking establishments. So many in fact that I earned 4 badges on the first day! Exit Brewing, my best new brewer of last year and now Ratebeer's best Australian new brewer, and their #003 was the beer to earn Heavy Weight (Level 25). It's a lovely, creamy Milk Stout! If you haven't managed to try any of the offerings from these guys yet, go out of your way to get some - they're all great! 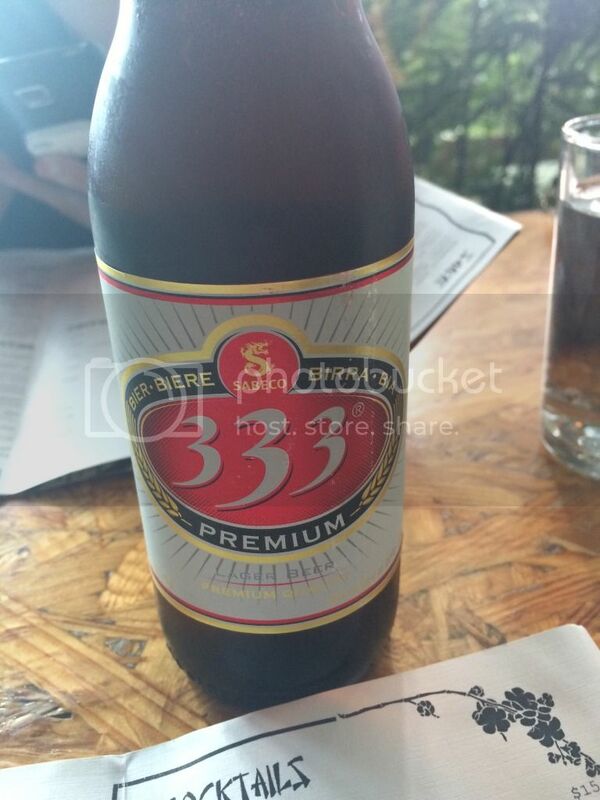 333 Premium is a lager from Saigon, Vietnam. Normally I try and stick away from the Asian lagers but when at dinner at Miss G, a Modern Vietnamese restaurant in Sydney, it almost seems appropriate to drink one... It was quite sweet and a little bit nasty though, which was a real shame as the food was excellent! It always disappoints me when restaurants have such an extensive wine list and stock only a few bland very similar beers and don't even dignify them with glassware, beer goes just as well with food! Little rant aside, Lager Jack (Level 38) was the badge; the second time Lager Jack has appeared this post, probably avoid this; it's not great. The Wild Beer Company from the U.K. are making some really lovely stuff at the moment. Their Sourdough - a collaboration with Hobbs House Bakery, using their 58 y.o. Sourdough yeast culture - is the latest in a line of beers that have impressed me. From my readings it's loosely based on a Berliner Weiss, but to me was a bit tarter than the average Berliner Weiss. Clocking in at only 3.6% it's a sour you could drink all day! It earned Pucker Up (Level 13). My fourth badge of the day went to Woodchuck Hard Cider Amber. Yes there is a Cider on Beer O'Clock Australia! I was in Barny's Fine Wines and Ales is Roseberry (great bottleshop by the way!) today and saw a 6-pack of this. Remembering last year's Woodchuck Cider badge, that hung around forever, I decided to kill two birds with one stone and buy Lizzie some cider and me a badge. Little did I know that Land of the Free (Level 29) would be thrown into the bargain... Read more about the Cider if I get the Woodchuck (2015) badge.